The user interface contains common elements found on most screens in the application. It is of great advantage to understand the basics of these elements. My Profile: Edit your own profile. See My Profile for details. Logout: Terminates your session. It is always a good idea to actively log out when you are finished using Opinio, so that others can't access your account while you are away from your computer. Surveys: Survey creation and management. See Design a survey for details. Report Portals: Access this link to create or manage report portals. 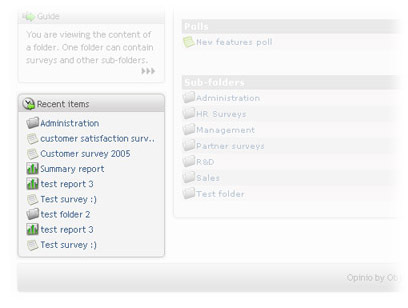 Use report portals to publish your survey reports. See Publish your reports (portals) for more details. My Panel: Link to the panel management module, which allows building a database of panelists, with attributes to make survey sampling and invitation easier. See Panel Management for more details. Resources: To manage your reusable resources, like files, headers/footers, dropdown lists, invitation lists etc. See Reusable resources for more details. Users: For managing Opinio users (authors/admins). Only users with access rights to manage users will see this menu item. See the section called “User management” for more details. Setup: The Opinio configuration module. Only users with super-user access can use this area. See the section called “Setup” for more details. Help: Link to the main page of the user documentation. Search field: The main menu bar has a search field that allows you to search globally in the system. You can only search for items that you have access rights to (read, modify, etc). The system will search through all surveys, folders, users and other resources as they are being added with new versions of Opinio. Currently it is only the name and id of the resources that are being searched, in addition to the ID. This will be expanded in later versions. Page Icon: On each page in the system, there is a large icon on the left side below the main menu. This indicates the function of the current page. 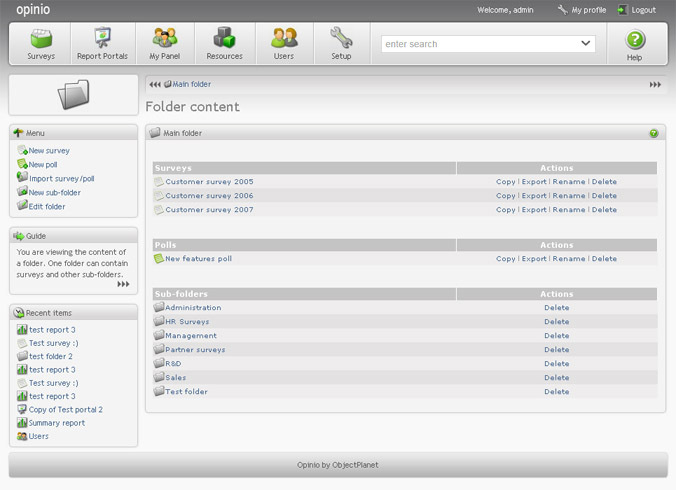 For instance, if you are viewing the content of a folder, a folder-icon will be displayed as the page icon. This icon exists to make the user interface more intuitive. It is often easier to recognize the page when looking at this icon, instead of reading the text on the page. Crumbs: This is the collection of links right below the main menu. It is a very useful indication of your current location in the system. For example, it will tell you exactly which folder (or sub folder), the survey, and report you are currently working with. You can then click directly on the crumbs items to access one or more levels up. Menu: All pages in the system have a page-specific sub menus. When you are viewing folder contents, for example, you will see that the menu contains links to create new folders, import to folder, and so on. The menu may also contain other useful links, to shorten the number of clicks when working with various resources (link to survey admin page when editing questions, for example). Page title: Each page has a page title above the main content box, which will describe the purpose of that page. Main page content: The main content box is displaying the actual page content. This could be a form for editing a resource, or various other information. 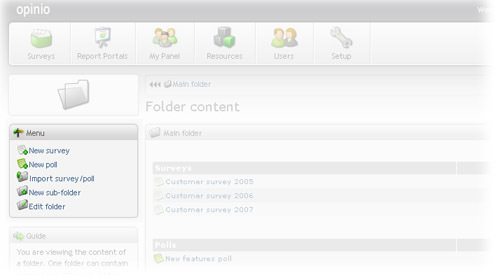 Main page content help: The help-icon at the top right corner of the main content box will link directly to the place in the user documentation describing the current page. Guide: The guide-box on the left side of the screen (below the page menu) is meant to provide a short description of the current page. For more complex resources, like surveys, the context guide will display a list of steps recommended for creating the resource. The context guide will indicate what steps you have begun using (blue overlay icon on the steps), and what steps are completed (green check-mark on steps). On the lower right corner of the guide, there is a link to the guide details. If you have limited access to the resource you are viewing, the guide items is either not shown or displayed as text items (no links). The guide details screen will display each step, and a history for each step, and which user has performed each step. Each step must be set to completed-status manually if desired, or may be reset. Note that these steps are simply a guide and a checklist, they do not have to be set to complete when you have finished creating your surveys or other resources. Recent items: The items at the lower left side of the screen contains the items you have recently accessed. This is a very useful and quick way go back to items you have recently been working with. Current screen menu highlight: The current screen menu choice is highlighted with a light gray background.